Hardee's, a famous American fast food chain, is under massive criticism by social media figures for their marketing campaign. 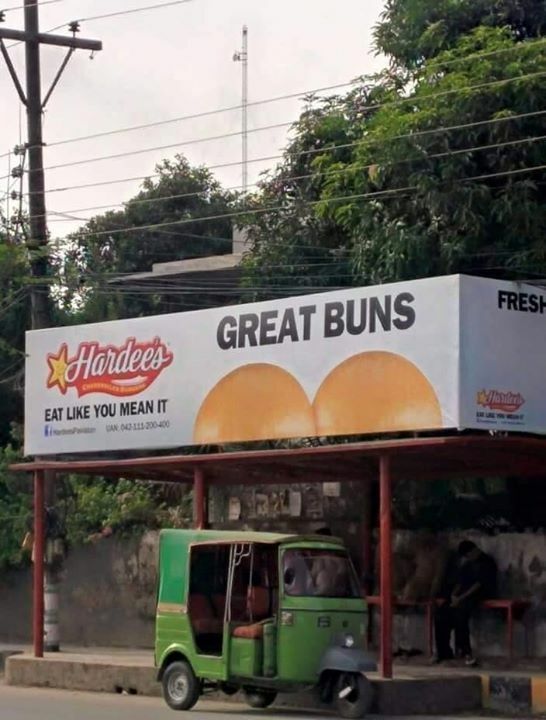 A recent marketing strategy has raised eyebrows of civil society as Hardee's executed a subliminal advertisement of their products. People over the social media are found aggressively angry for such advertisement that is considered adult by several people. Many marketeers have said that international brands must consider cultural norms and values of a society before the execution of their copies. Hoardings and banners of Hardee's are seen Lahore at various public places including their own restaurants. In their ads, they have shown images of breads in such a way as if it is a particular part of women's body. In several other ads shown in Pakistan, they have used such taglines and images that are above the threshold of sensation. People are protesting over these ads on Facebook and are demanding Hardee's to immediately pull off their campaign. Several social media figures have asked their followers and fans to boycott Hardee's country-wide for not keeping in mind religious and cultural norms of Pakistan. Head of Marketing department of Hardee's has somehow neither responded nor pulled off this campaign so far.